Greensboro, N.C. (May 22, 2017) – A sophomore Theatre Arts major from North Carolina Agricultural and Technical State University won the prestigious Irene Ryan National Acting Scholarship Competition recently at the Kennedy Center American College Theatre Festival in Washington, D.C.
Ashton Ross’s performance earned him $5,000 in scholarship funds, as well national recognition in the college theater community. He is the second A&T student to win the competition; Melodie Garrett was the first, 30 years ago. His acting partner, J’laney Jenkins, 23, of Leland, North Carolina, who graduated from A&T earlier this month with a Bachelor of Science in Journalism and Mass Communication, earned a $1,000 scholarship in his support role. Ross also won the coveted National Partners of the American Theatre Classical Acting Award. That award comes with a three-week residency at the internationally renowned Shaw Festival including travel, lodging and meals. A 26-year-old native of Houston, Texas, Ross pursued a decidedly different path to his acting. He came to A&T as an Urban and Community Horticulture major. 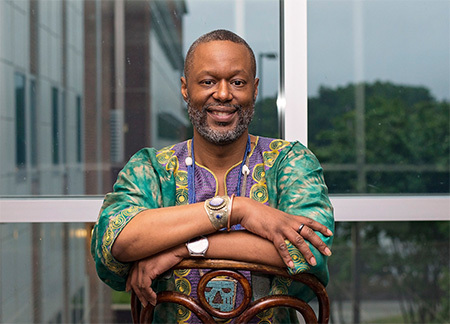 But his stage talent was so notable, faculty in the A&T Theatre Program encouraged him to consider changing majors, which he did in fall 2016. In doing so, he also had to weigh the demands of acting work on his health. Ross battles Crohn’s disease, a chronic intestinal disorder for which there is no cure that can cause severe abdominal pain. Ross is open about his struggles with the disease, and credits A&T Student Health Center staff with providing strong support for his health needs during his time at the university. Ross’s prize-winning performances included a classical monologue from Shakespeare’s “Othello,” as well as excerpts from two black contemporary works: “Topdog/Underdog” by Suzan-Lori Parks and “One Monkey Don't Stop No Show” by Don Evans. Ross noted that only one other monologue from a black playwright was performed in the competition – by a University of Oklahoma student, who also won a scholarship – and that all three performances culminated in prizes. “I say this to encourage budding playwrights, screenwriters and novelists of color to continue writing and telling stories that are unique to us,” he said. “I take no credit for the work that was done on stage. I honor the guidance of my ancestors and my faith for leading me to victory,” said Ross. “It still has not fully set in that I accomplished such an incredible feat, but I'm grateful and humbled, nonetheless. As an independent, out-of-state and non-traditional student, I greatly appreciate the funding provided by the Irene Ryan Foundation for this win. “Lastly, I want to thank my partner J’Laney for his hard work and dedication throughout this process. Without him, the win would not have been possible. In addition to his $1,000 scholarship from the Irene Ryan competition, Jenkins took second place in the Mark Twain Scholarship for Comic Performance Awards and another $500 scholarship, as well as the Kingsley Colton Award for Outstanding Partner, a $500 cash prize sponsored by the Actors Equity Foundation. The awards were presented during the festival, which ran April 17 – 22 at the Kennedy Center. This was the 45th year for the Irene Ryan competition, which is named for the acclaimed stage, motion picture and TV actor best known for her iconic role as Granny on “The Beverly Hillbillies,” which ran on CBS from 1962-1971. The show continues to be televised daily around the world in syndication. The Irene Ryan competition is perhaps the most prestigious for college actors. The American College Theatre Festival this year involved more than 18,000 student actors from universities and colleges around the country. Ross and Jenkins were coached by Darius Omar Williams, Ph.D., the N.C. A&T Theatre Arts program director. Williams is also executive director of A&T’s Paul Robeson Theatre. As an additional part of Ross’s prize, he will attend the acclaimed Shaw Theatre Festival during the month of July in Ontario, Canada. A&T’s Theatre Arts Program is one of only two at historically black colleges and universities where students have won the Irene Ryan competition. Started in 1969 by Roger L. Stevens, the Kennedy Center's founding chairman, Kennedy Center American College Theatre Festival (KCACTF) is a national theatre program involving 18,000 students from colleges and universities nationwide. It has served as a catalyst in improving the quality of college theatre in the United States. KCACTF has grown into a network of more than 600 academic institutions throughout the country, where theatre departments and student artists showcase their work and receive outside assessment by KCACTF respondents.